As a boy, Carson taught himself magic tricks, and he started in show business as a magician ("The Great Carsoni"). He later worked as a radio voice, game show host, and comedy writer for The Red Skelton Show. When Jack Paar quit The Tonight Show, Carson got the gig, and asked Paul Anka to write a theme song; instead Anka submitted "It's Really Love", a tune several years old that hadn't been a hit, and it became Carson's theme. 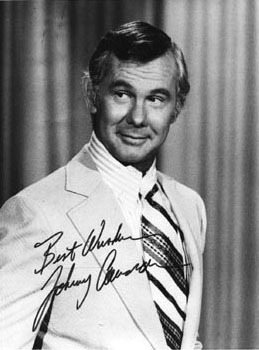 Carson hosted the Oscar telecast four times. His autobiography appeared in 1965, Happiness Is a Dry Martini. Ed McMahon was Carson's sidekick dating back to ABC's late-1950's game show, Who Do You Trust? When the far less funny Jay Leno took over The Tonight Show in 1993, Carson largely vanished from public sight. Videos culled from his Tonight Show years are still hawked on TV, and for years after his retirement he would give his friend David Letterman material to use on-air, which Letterman would punctuate with a golf swing.